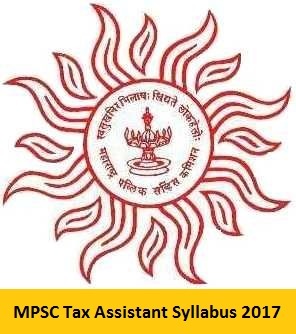 MPSC Tax Assistant Syllabus 2017-2018 and Exam Pattern are available on this page. Candidates can get the Maharashtra Public service commission Exam syllabus for the Tax Assistant posts. Aspirants who are searching for Maharastra Government jobs can grab this opportunity. Candidates who had applied for the MPSC Recruitment 2017 can check the MPSC Tax Assistant Syllabus 2017 along with Exam Pattern. The Tax Assistant exam was conducted for 400 marks. It is an objective type exam. It contains 200 questions. Each question carries two marks. The test will be in the Marathi Language. The total time duration for these post is 2 hours. Recently the Maharashtra Public Service Commission had disclosed the recruitment notification for 296 vacancies. This announcement is to fill the Tax Assistant Group B Vacancies. The application process ends on 7th November 2017. So candidates have to hurry up for submitting the application forms. Good news for the candidates who are searching for MPSC Tax Assistant Syllabus 2017-2018. Candidates who are interested in checking the MPSC Tax Assistant Syllabus 2017 must visit official website www.mpsc.gov.in or the aspirants can find MPSC Tax Assistant Syllabus and Exam Pattern in the below section. Maharashtra Public Service Commission has recently issued an employment Recruitment Notification and invited applications from the eligible candidates. We have given all the detailed information regarding Syllabus and Exam Pattern. Syllabus plays an important role for every competitive Exam and with the help of Syllabus contenders will prepare in the better way for Exams. 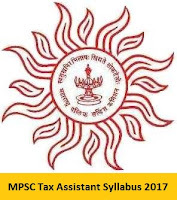 Aspirants who had applied for the Tax Assistant posts can check MPSC Tax Assistant Syllabus 2017-2018 from this article. Every year the authority conducts the Tax Assistant examination for the candidates who are waiting for latest government Jobs in Maharastra State. There is a huge competition for this exam aspirants can check the MPSC Tax Assistant Syllabus 2017 and start your preparation with MPSC Tax Assistant Exam Pattern. Aspirants should practice more Previous Papers to crack the test easily. Applied candidates can check the MPSC Tax Assistant Exam Pattern in this section. By checking Exam Pattern candidates can get the clear idea about subject names, the number of questions asked in the question paper, time duration etc. Written Test and Personal Interview are the rounds of the selection process. Hope the given information about MPSC Tax Assistant Syllabus 2017-2018 is helpful for the candidates. Visit our website www.allindiajobs.in to get more details regarding all competitive exam Syllabus.